As a relatively new venture, having been established in 2010, St Peter Line uses a contemporary, world-class ferry named Princess Anastasia. 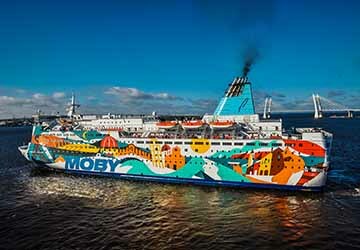 Having merged with the Italian operator Moby Lines in 2016, St Peter Line chartered its previous vessel, Princess Maria to the Mediterranean, which now sails between the Mediterranean islands of Corsica, Sardinia and Elba. Remaining in the Baltic region, Princess Anastasia is both modern and stylish, with a huge passenger capacity of two and a half thousand, and a crew consisting of three hundred and fifty members. Making the long-haul journeys as manageable as possible, the ship boasts eight hundred and thirty four cabins, all fitted with individual showers, air-conditioning and plenty of clothing storage. The ship also offers excellent facilities including numerous restaurants and bars, a conference hall, cinema and a well-equipped children’s play area, as well as a swimming pool, gym and spa with a sauna, ideal for a wintery Baltic cruise. With directferries.com you can find St Peter Line timetables, fares and book St Peter Line ferry tickets. Where applicable we’ll also compare St Peter Line with alternative ferry companies.